After watching an episode of Dance Moms, I saw all the cool train cases the girls had and one of them had something similar to this NYX train case. Though the case I have is one I've searched for, (which seems like years) is sufficient when I travel, I would love to have this lighted one. How many times have you stayed at a hotel where there wasn't a vanity? Or when the mirror was so far away from the counter? So after searching online I came across one that caught my eye and from one of my all time favorite cosmetic brand. I love this NYX train case and need it in my life! It's a bit price as it retails for $500.00. Especially since I'm not a professional makeup artist I can't see myself spending this much. 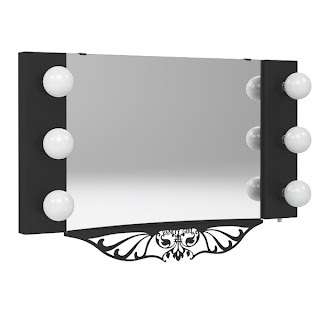 For the price, I can totally go for a Vanity Girl Hollywood Mirror. 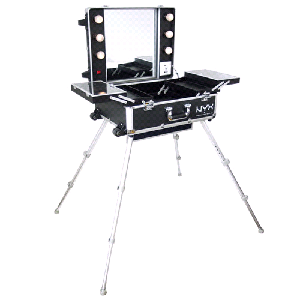 My favorite of their collection is the Floating Starlet Lighted Vanity Mirror. This retails for $299. I first came across this on Beauty Broadcast about 6 months ago when Emily did her review. Watch the video here. This is something that is probably more practical since all my beauty products wouldn't fit into the NYX case anyways. If my Hubby could have his way, then he'd like the case if all my products fit only in the case. HA! Do you plan on getting the train case or the mirror? Do you already have one or something similar? Tell me about it!